Living near airports might not only lead to residents suffering sleepless nights – they could also have terrible weather, scientists say. For aircraft increase the chances of snow and rain when they take off and land, an extraordinary study suggests. Apparently the effects of jet planes punching through clouds are similar to ‘cloud seeding’ operations, where ice crystals are created in the atmosphere to make it rain. The findings – published in the respected academic journal Science – are based on satellite images of clouds around airports and computer models of cloud behaviour. 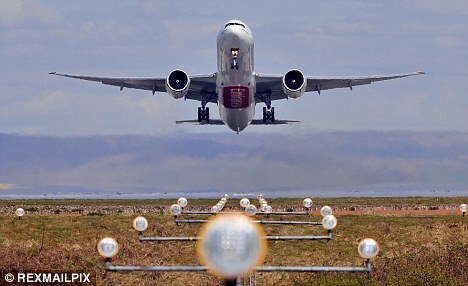 The side-effect of flying is likely to be most obvious around the world’s busiest airports, such as Heathrow where more than 1,200 planes land or take off every day. The phenomenon occurs when aircraft smash through clouds containing ‘super- cooled’ water – or water that exists as droplets of liquid at temperatures of minus 10 C or below. As an aeroplane passes quickly through a cloud, the air behind the wings and propellers expands and cools rapidly. These sudden drops in temperature can be enough to freeze droplets of super-cooled water – turning them into a stream of ice crystals. 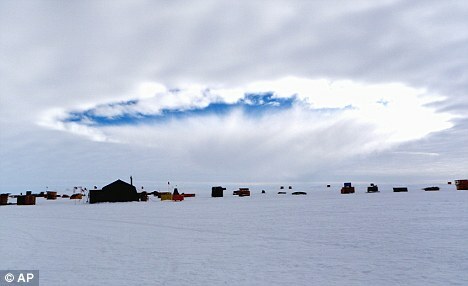 Over time, ice crystals grow and affect neighbouring drops of water – creating a hole in the cloud that expands for several hours and increasing the chances of snow or rain on the ground underneath. Dr Andrew Heymsfield, of the National Centre for Atmospheric Research in Boulder, Colorado, said aircraft increased the chances of snow when they punched holes in clouds after taking off and when they created ‘canals’ in clouds when descending. ‘Whether an airplane creates a hole or a canal in the clouds depends on its trajectory,’ he said. The study found that super-cooled cloud layers are found with 62 miles of the world’s major airports at least five per cent of the time. The cloud seeding effects are more noticeable closer to the north and south poles. The researchers looked at 20 satellite images of cloud cover with holes suspended over Texas on one day in January 2007. Some of the holes were visible for more than four hours and grew more than 60 miles long. The team then looked at flight data from the US Federal Aviation Administration to find out what aircraft had flown in each area, between 4.3 and five miles high, on that day. They discovered that a range of aircraft can produce holes including jumbo jets, military planes and private single engine jets. The researchers say it is unlikely that aircraft affect the global climate. However, it may increase the need to de-ice planes more often in the future, they say. It’s not the first time scientists have linked aircraft to weather. Earlier this year, a study concluded that condensation trails – formed when the water vapour from aircraft engines freezes – may be doing more to warm the planet than the greenhouse gases released from aircraft engines. The clouds trap heat radiating back from the Earth’s surface, German researchers reported in the journal Nature Climate Change.